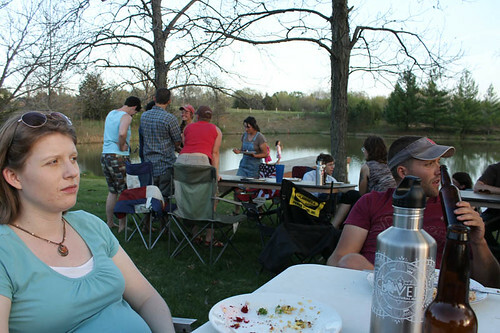 We spent the first day of April out enjoying the unseasonably warm weather at Green Pastures Farm for the 2nd monthly Mid-Missouri young farmers potluck dinner. Despite Google Maps best efforts, we managed to find Greg and Jan Judy’s farm near Clark, Missouri for the dinner. The first dinner was held in Fayette at Blue Bell Farm. There was a bit of excitement when word spread that a few of Greg Judy’s interns would be making an appearance. 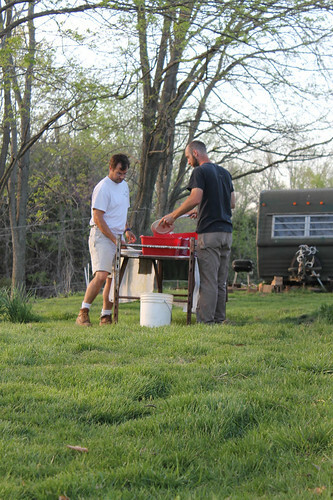 Unfortunately, I had a scheduling conflict last month, but when I heard that Greg and Jan had offered to host the dinner this month, I wasn’t about to miss an opportunity to see their operation. In the pasture nearest the house there were probably 100 head of just-weaned calves. They weren’t making too much noise (for just weaned calves) and Greg explained that they move them to a new paddock every 5-6 hours just after weaning to keep them happy, and a bit quieter. The bulls had all been pulled from the main cowherd and were being run with the calves. If you noticed in the photo, a fair number of the calves were bulls themselves. It looks like the Judy’s practice delayed castration. Another thing I that the Judy’s did that I really like was to put up 200-300 bird houses throughout their property. You can see two of them in the background of the photo. Greg says that a barn swallow (which the houses are designed for) eat flies almost exclusively. That might be whey their cattle didn’t have many flies on them. 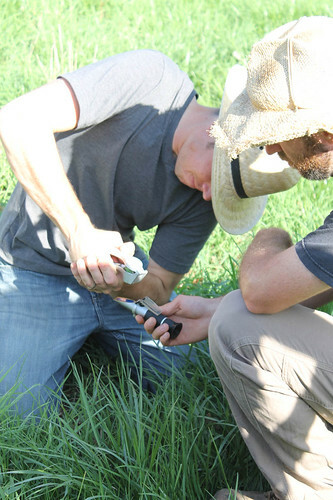 We stopped in the paddock adjacent to the weaned calves were Greg’s interns demonstrated the refractometer for measuring sugar content (energy) of grass and forage species. First, the grass or forage is picked and loaded up in a garlic press. Here one of the interns is pressing “Grass Juice” out onto the refractometer. 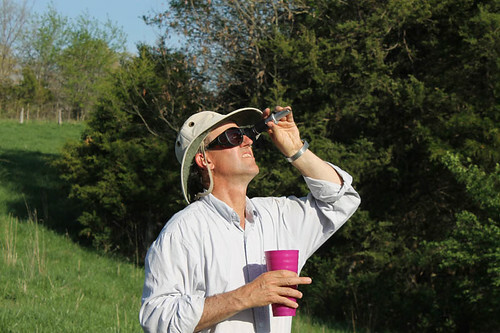 Here Greg holds up the refractometer and takes a reading. The grass (fescue) was reading around 7 (Brix I think) and the red clover was up around 16. 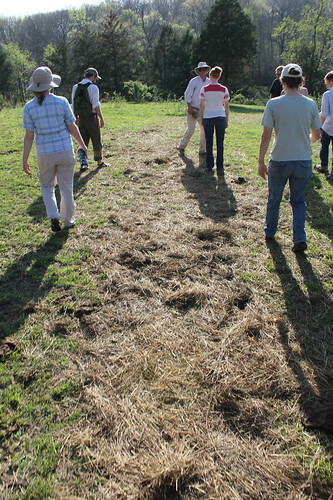 Next we walked down to a pasture below the house that had been mob-grazed two days ago. There had obviously been some hay rolled out on the pasture, and Greg explained that with the lush, protein-rich early spring growth, some higher-carbon hay was fed to counterbalance the green stuff. 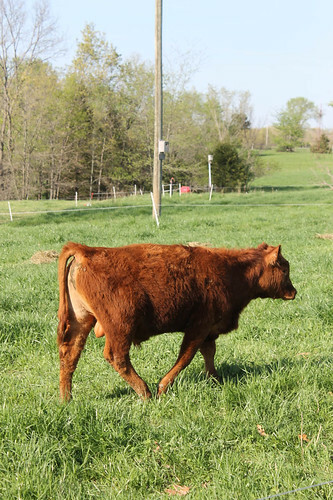 It was pretty easy to see that the resultant cow-patties were not as loose as most you see during the early spring. 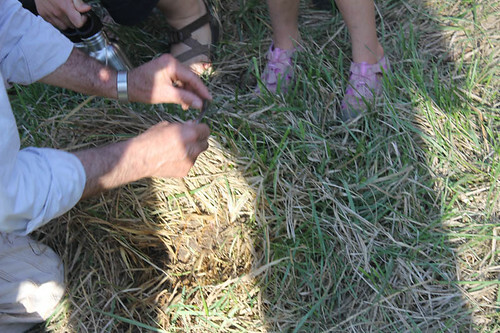 Greg spent the next 15 minutes digging around in the pasture, pointing out earthworm castings, dung beetles, and the finer points of cow-patty diagnostics. After we asked all the questions we could think of, we headed back up to the house for the main event: Dinner! These young farmer potluck dinners are the best potluck dinners that you could ever hope for. Everyone that comes brings some really great food. It probably helps that they’re all farmers, and have access to the best meat, eggs and produce that you’re likely to find. And did I mention the Goatsbeard cheese? Here my lovely wife lapses into a food-coma as Bill Sullivan takes another swig of the homebrew I brought while the fine folks at Happy Hollow Farm are chatting in the background. After dinner, we gathered up our plates and headed over to the wash station, where the guys show how it’s all done. A lovely evening spent in great company, I couldn’t ask for more. Goodbye Pink Slime, Hello Arsenic.